Whether you're looking to create the perfect setting for your summer barbeques or your annual company fundraiser, a Eureka Traditional Party Canopy can help. This classic-style party tent offers clean lines and an uncomplicated look that pleases the eye without being distracting. You'll also find that the open, spacious design means that you'll have more space for guests, tables, marketing materials, or whatever else you need to house in your portable shelter. 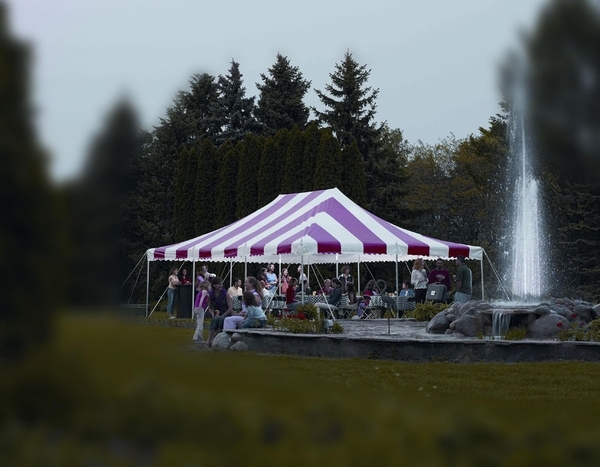 You may think that setting up a party tent is something best left to professionals, but that really isn't true when you've got a tent like the Eureka Traditional Party Canopy. This pole tent requires a relatively small number of easily-identified parts and can be installed by just two people - note that we say two people, not two installers or tent experts. And when your event is over and you're ready to leave, your tent comes down just as quickly as it went up and fits neatly into the included storage bags. Finding the right party canopy can be as intimidating as planning an outdoor event, but you don't need to worry. The Eureka Traditional Party Canopy can provide you with user-friendly weather protection at price that won't break your budget.